There is always something about picking up a book by Sherryl Woods. It's like...coming home. There...I said it again and I truly mean it. I am a fairly new fan of her writing. It wasn't that long ago that I found her novels on a bookstore shelf while on vacation. I picked up her books purely because of the cover. I fell in love with the O'Brien characters she created sitting next to the Rogue River in Oregon. Today, I finished the second book in the Ocean Breeze series and am loving a new family that Ms. Woods has created, The Castles. Wind Chime Point, is sister Gabrielle's story. And does she have a story! While I don't want to give away the secrets, I will say that the title plays a major role in the storyline. As with all of Ms. Woods stories, if there is a woman lead character, then there must be a man to play opposite of her. In this case, Wade Johnson is the guy who looks Gabi in the eye and makes her notice him. He's pretty easy on the eyes, so what woman wouldn't! Gabi, on the other hand, spends an exorbitant amount of time trying to fight her feelings for this guy, which clearly (at least according to her grandmother) is perfect for her. As always, I really love reading Sherryl Woods. 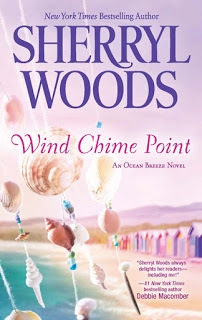 This is the second book in the Ocean Breeze Series, and as I have come to find out, sometimes one or more books in a series aren't always the same level of as the rest. While I liked the story, I wouldn't say that it was better than the first. There is some continuation from the first book, and hints of things to come for the next one. I would expect nothing less from Ms. Woods. I only wished that there were some details that would have been expanded upon.